What a successful Hill day we had last week! 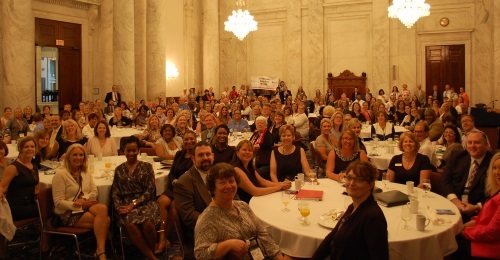 On Tuesday, July 11, 255 special educators from 44 states "stormed the Hill" in a thoughtful, passionate, and informed way! After intense training on Sunday afternoon and all day Monday, the state teams were confident and ready. We all had amazing stories to share on Wednesday morning as the summit wound down. But the big take away was the message must be delivered in a variety of ways all the rest of the 364 days! 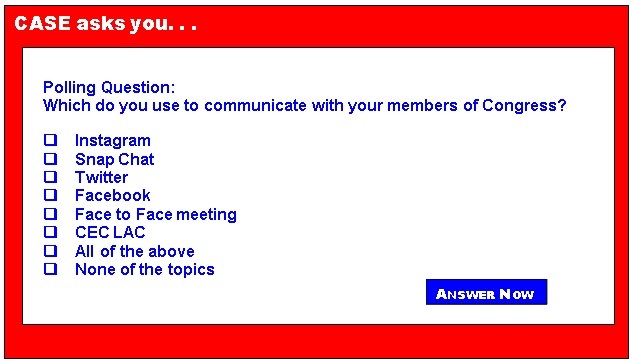 You can start your part right now by going to the CEC Legislative Action Center. Even if you have sent a letter on Medicaid, send another one! CEC staff shared with us about the large number (over 25,000) of emails which were sent concerning the nomination of Secretary DeVos and yet less than 400 have been sent on the Medicaid issue. Please take the time right now to visit the LAC and send your senators an email about not cutting the very vital Medicaid funds for students, many who have disabilities, in our schools! And by the way, why not start thinking now about a family vacation to D.C. — everyone should go to D.C.! We always are in a great hotel/location and why not combine work with pleasure! The dates for next year are July 8-11, 2018! We apologize! Our registration site was down off and on again last week! But we have extended Early Bird Registration thru Friday, June 21 to give you all a chance to get registered at the lowest price offered! Kindel Mason (ID), CASE Professional Development chair and his committee have put together an amazing program! The 27th Annual CASE Fall Conference will be held at the Nugget in Reno, Nevada, Nov. 2-4, 2017. Now is a great time to go ahead and reserve you room at the Nugget at the amazing group rate of just $81 a night — and that includes your airport to hotel and back transportation! We are working on registration and hope to have it up in the next month. In case you are part of your State/Provincial leadership — the CASE Board of Directors will be meeting all day on Wednesday, Nov. 1 and the morning before the conference starts at lunch on Nov. 2! Mark your calendars! The question last week was about our upcoming fall conference... "Which CASE Annual Conference Speaker are you most excited to hear from at the CASE Annual Conference, Nov. 2-4 in Reno, Nevada?" Looks like everyone is equally excited about all four speakers: Drs. Eric Hartwig, Rick Van Aker, Frances Stetson, and Randy Sprick! Each of these keynote speakers will be bringing the best, most practical information to all the attendees, don't miss this great opportunity! Thank you once again for making a difference in our schools, with our families and most certainly with students with disabilities! Multiple Degree and Licensure Options. These UNC licensure and Educational Leadership degree options are offered around the state and online to meet the needs of busy working professionals. They feature intensive instruction, innovative scheduling, and internship opportunities arranged during the school year so projects can be applied to your career goals. Students’ motives for violent and aggressive behavior are sometimes difficult to understand. It is even more challenging to assess and deter any potential threats students might make to their peers or staff members while in school. The tragic Columbine High School shootings in Littleton, Colorado on April 20, 1999, sparked a nation-wide growing concern for school safety and student mental health. Following the shooting, the Federal Bureau of Investigation (FBI), along with the help of experts, decided that a threat assessment approach is the best method of assessing the risk for school shootings and other school threats. This approach teaches school administration how to properly investigate, evaluate, and determine the credibility of each threat, as well as how to take appropriate action. CADRE has a new resource aimed at parents in English and Spanish: Educational Advocates: A Guide for Parents is an easy-to-read brochure that will assist parents in asking interview questions that will help get an understanding of an advocate's approach to providing support; connecting with parent centers in their state; and connecting with additional sources of information about advocacy. Click here to read it in English and Spanish. CADRE recently released IDEA Data Brief: Due Process Complaints/Hearings. Data presented in this brief on Due Process Complaints include dispute resolution data reported to OSEP by the states. This brief is one in a series that examines eleven years of IDEA dispute resolution activity, concluding in 2014-15. Click here to download the brief. Registration is now open for Restoring Focus on the Child: The Seventh National Symposium on Dispute Resolution in Special Education, convening October 18-20, 2017 in Eugene, Oregon. For more information about the event, please visit the event website. Is using a fidget spinner for timed math problems helpful or harmful? Summary: The Secretary of Education (Secretary) amends the regulations implementing Parts B and C of the Individuals with Disabilities Education Act (IDEA). These conforming changes are needed to implement statutory amendments made to the IDEA by the Every Student Succeeds Act (ESSA), enacted on December 10, 2015. These regulations remove and revise IDEA definitions based on changes made to the definitions in the Elementary and Secondary Education Act of 1965 (ESEA), as amended by ESSA, and also update several State eligibility requirements to reflect amendments to the IDEA made by ESSA. They also update relevant cross-references in the IDEA regulations to sections of the ESEA to reflect changes made by ESSA. These regulations also include several technical corrections to previously published IDEA Part B regulations. < b=""> In accordance with the Paperwork Reduction Act of 1995, ED is proposing a revision of an existing information collection. Summary: In accordance with the Paperwork Reduction Act of 1995, ED is proposing a revision of an existing information collection. Summary: The Department of Education is issuing a notice inviting applications for new award for fiscal year (FY) 2017 for Technical Assistance and Dissemination to Improve Services and Results for Children with Disabilities — National Center to Enhance Educational Systems to Promote the Use of Practices Supported by Evidence, Catalog of Federal Domestic Assistance.